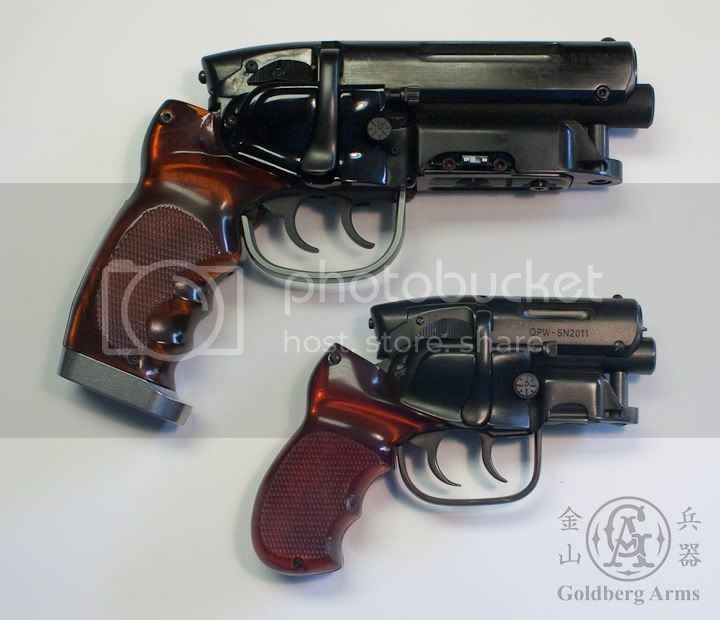 Propsummit.com a Blade Runner Prop Community Forum BladeRunnerProps.comView topic - Goldberg Arms Snub Nose Blaster Kits - RE-ISSUE! 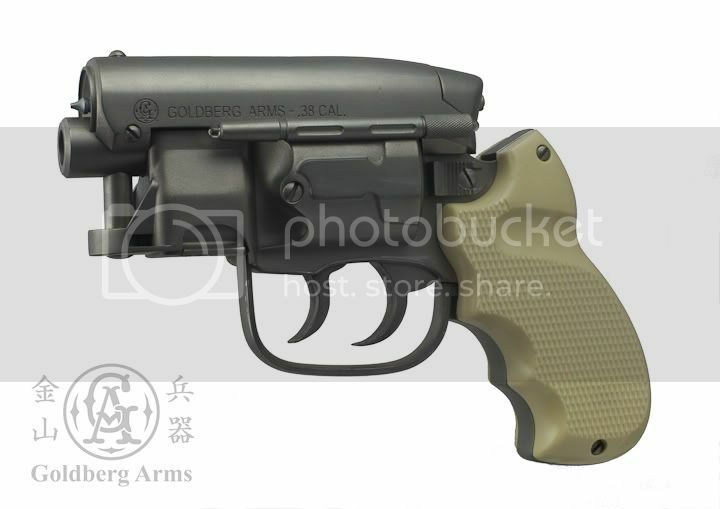 Goldberg Arms Snub Nose Blaster Kits - RE-ISSUE! Posted: Fri May 13, 2016 11:28 am Post subject: Goldberg Arms Snub Nose Blaster Kits - RE-ISSUE! This is to gage interest for a new run of my Goldberg Arms Snub Nose Blaster resin kits. These will be basically the same as the kits I sold a few years back but with two exceptions; the ammo clip will be one piece instead of two (no removable clip) and I will be offering only black rubber and faux ivory grips, no clear amber grips. Price will be $329 plus shipping. Please post if you would like to be on the waiting list (serious interest only, please!). I will not be taking any payments until the kits are ready to ship. I don't have the skills to do a kit justice but would be seriously interested in a finished model. Put me down for one Dave. I still have to build the last one, but I can't not buy this! This is a pretty small community and most who already want one have one. I've got interest for 8 kits over at the RPF. that's just fine. I only wanted to make a dozen or so. 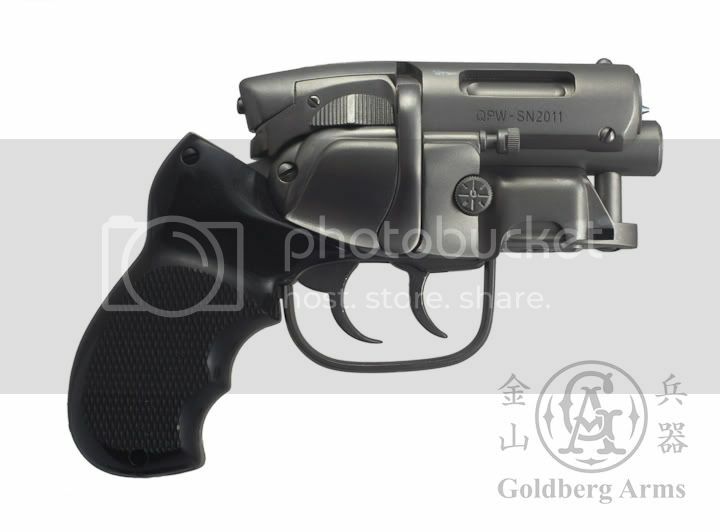 I would LOVE to design a soft holster for this, I think it's a great design. Put me down for one if you do a run, please. As with all projects, it's all about the interest level. Sorry for the Hijack, Dave. So I tried out a new clear resin that seems to work much more reliably than the resin I used for the first run. With that in mind I'm prepared to offer a different selection of grips. I'm dropping the Faux Ivory. "Why not clear amber?" I hear you ask. Couple of reasons, first I wanted to do something different for this run and second, getting the amber color just right takes a lot of trial castings. the right color is a fine line between Piss Yellow and Salmon Pink. As this is a relatively short run, it's not worth the hassle. Please PM me with your choice of grip color. THIS RUN IS NOW SOLD OUT! An update - I've had to make a new three part mold of the clip housing as the old one was shot. The good news is that the clip will still be removable with this run and not molded in place as I had previously mentioned. Dave, do you recall what silver paint you used in that first pic? As I recall I was trying to simulate a nickle finish. I think it was a mixture of silver and a little brass over a flat black primer. Probably Tamiya acrylics. If I were to do it again, there are some new Metallic acrylic paints from Vallejo that are supposed to be incredible. Very metallic, very durable. I would try those. Update - cranking away! 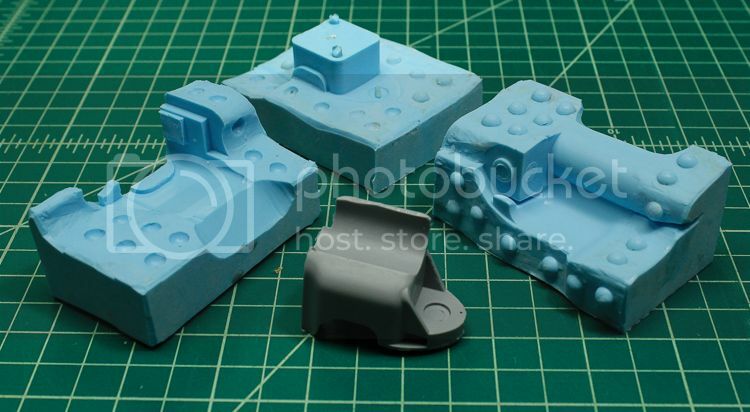 Got the three piece mold done for the clip housing and am about halfway through casting the dozen or so parts needed. As the weather warms up, the success rate of the clear grips is dropping. Damn! So once I finish casting the clip housings I'm going to move the pressure tank casting set up from the garage portion of my shop to the air conditioned machine shop in the back. Hopefully that will speed things along. All good Dave. Thanks for the update. I'm sure we would all rather have a product that you were proud of over one that you felt was rushed and headed out the door before you were happy with it. Posted: Sat Jan 27, 2018 10:05 pm Post subject: 4 kits available! There are four kits available from the very limited third run! For grips there are three sets of clear (slight off-water white), 4 sets of hard black rubber and one set of faux ivory available. 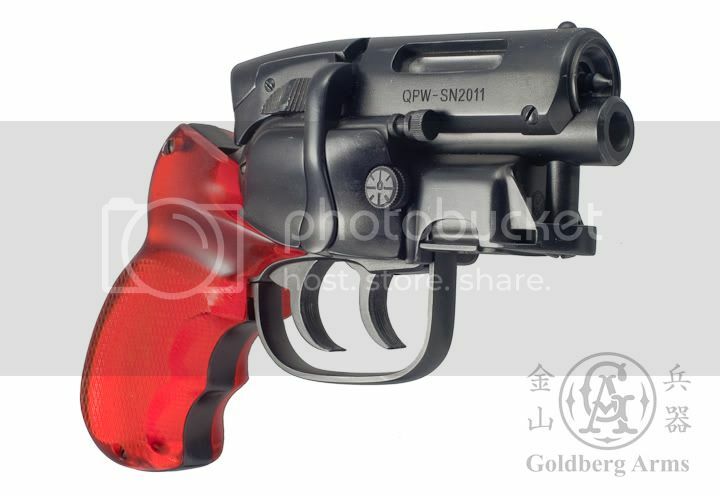 Sorry, no amber grips. Price is $329 plus shipping. Please PM me if you are interested with grip election and country of residence. A buyer backed out so the is ONE and only one kit left. Hard Black Rubber grips only. The molds are shot. There will be no more kits made! If you have been on the fence, this is your last chance! $329 plus shipping. PM me if interested.